The show will feature funny behind the scenes anecdotes from TV, live auctions, exciting antique finds, huge profits, even bigger losses, as well as stories from celebrity TV appearances and historical journeys through time. It’s all part of what makes this show like no other. 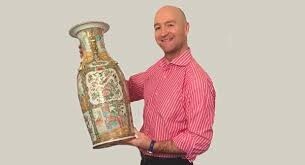 David Harper is a BBC TV presenter well known for his appearances on Bargain Hunt, The Antiques Road Trip, Put Your Money Where Your Mouth Is, Flog It and For What It’s Worth. These hugely popular BBC programmes are shown in over 50 countries worldwide. David has appeared on many other BBC TV programmes too from The One Show to Celebrity Masterchef, Through The Keyhole to Countryfile, Celebrity Eggheads to The Heaven & Earth Show! The show is very much audience led with involvement in the form of questions from the audience or questions and challenges from David throughout, as the talk develops.